The retail world is only just awakening to the potential of the Internet of Things, or IoT. With new interconnectedness among a variety of devices, customer data is coming to the fore in a new light. Connected devices can help retailers identify shoppers’ preferences and habits to create a more compelling in-store experience, and can drive inventory data management, enabling supervisors to take a more data-centric approach to salesforce deployment on the floor. 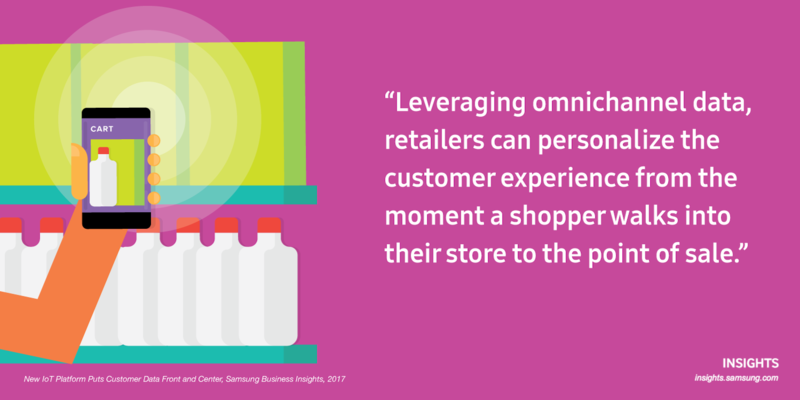 The emerging role of data in the retail space has the ability to create a seamless omnichannel experience for consumers from the time they walk into a store until after their payment is completed. Here’s an example of what the customer journey looks like in a data-driven, IoT-empowered retail environment. Customer service: An online customer puts a pair of boots in their shopping cart, or purchases them for in-store pickup. When they enter the store with the retailer’s app enabled on their phone, a proximity-driven beacon recognizes the customer and notes their pending purchase. Employee engagement: Data from the customer’s shopping cart is then conveyed via a wearable device to a retail associate, who approaches the customer with information about their desired item, saving employees time and increasing customer satisfaction. Smart merchandising: In addition to the employee-guided experience, customer data can also drive smart merchandising through IoT devices that pick up on past shopping patterns, identify items of potential interest and highlight these based on customer proximity. Traffic patterns and promotion effectiveness: Sensors can identify how many people enter a store and create “heat” maps to better understand shopping patterns, provide hard data on the impact of new displays and allow changes to be made on the fly. Rapid mobile payment: Using mobile payment data, a store associate can scan merchandise into a smartphone and complete the transaction using NFC-based payment. The customer and associate could, for instance, simply tap their smartphones and use Samsung Pay to complete the sale. Back office efficiency: Once the transaction is completed via phone, POS tablet or through in-store touch screen device, these connected devices communicate with back office systems, where inventory data is adjusted in real time, ensuring manager records are current. Read this white paper to learn how IoT can help you close the gaps in omnichannel retail. To make this customer journey possible, there needs to be a robust, flexible IoT infrastructure running behind the scenes, a platform powerful enough to collect and manage data across a wide spectrum of interoperable devices. Samsung ARTIK, an integrated smart IoT platform, allows retailers to take advantage of IoT to bridge online transactions with in-store technologies, giving them access to the full potential of the omnichannel shopping experience. It’s the underlying tool that helps to turn IoT data into a 360-degree view of in-store operations as well as a highly tailored customer experience. Samsung ARTIK is an end-to-end platform that unifies hardware, software, cloud, security and partner ecosystems to make it easier for retailers to implement IoT solutions. ARTIK Modules are ready to integrate into small or large-scale “things,” creating smart, connected devices from door locks and in-store sensors to big, connected and immersive displays. ARTIK Cloud taps the power of the cloud to enable retailers to maximize the value of IoT data. The cloud platform facilitates easy interconnections between data sources. 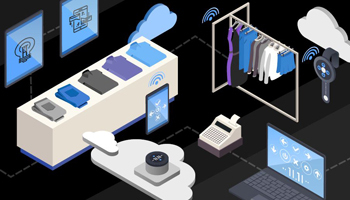 Devices like sensors, POS equipment, smartphones, or smart signage can be linked via open web APIs, making it possible to connect and share data securely and generate new insights into store operation and customer behavior. ARTIK can connect existing clouds or create a data exchange platform from scratch to fill a specific need. The rise of connected devices is poised to unleash an avalanche of valuable customer data in the retail arena, giving sellers unprecedented opportunity to customize their offerings while simultaneously gaining new insights into their own operations. With powerful modules, ready cloud connectivity and an ecosystem of designers and manufacturing partners, Samsung ARTIK can help retailers realize that untapped potential.